If you need a better garage, you can count on Custom Garage Works! In 2003, we started providing top quality garage floor coating in Springtown, TX after we wanted more out of our own garages. While we were unable to find the services we wanted inside of the industry, we did not let that stop us, but instead, we decided to join the industry ourselves. We now provide our clients some of the greatest custom garage solutions available, including high quality cabinets and incredibly durable floor coatings that are superior to epoxy coatings. We are passionate about fantastic garages, and while we started with a simple garage floor coating service, we are proud to provide many additional custom garage solutions to the DFW area. 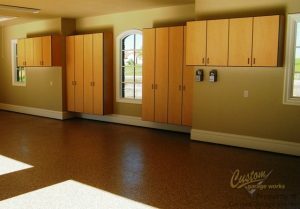 Our premium garage floor coating in Springtown, TX is one of our most common garage options! This is because our polyurea polyaspartic coatings cure into a superior finish that lasts for decades. Unlike epoxy that can yellow in the sun, and peel or fall off over time, these coatings are stronger and more resilient. Since we only use a diamond grinder to prep the floor for coating, as opposed to acid etching, we can ensure a higher quality end result. If you’re looking to learn more about our reliable garage floor coating services, give us a call at 214-494-9068 or 817-308-1305 and ask for your free estimate! Thanks to Custom Garage Works’ organization solutions, you won’t ever need to worry about running out of space in your garage again. 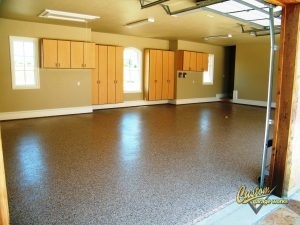 We know your new garage floor coating looks best when it is not covered by a mess of belongings! To meet the unique organizational needs of our clients, we offer a variety of different organization products, including overhead storage racks and cabinets. We carry some of the most resilient overhead storage racks in the industry, and our storage cabinets are specifically made for garage needs. If you need a resilient garage floor coating in Springtown, TX, and unmatched organization solutions, you can count on Custom Garage Works. Overhead Storage Racks If you want to get more from your overhead storage space, our storage racks provide safe and dependable storage. And More! Do not be worried by clutter in your garage any more. We have the organization products you need!